past week has not been the most productive one in the Factorio history. The Christmas was a good opportunity to take couple of days off, relax and spend some time with the family. In the meantime some more bugs have popped up in the 0.8.x resulting in the release of the 0.8.4, the current shot at the stable release. All in all we overcame many obstacles, some of them seemed impossible a year ago. Of course it hasn't been all smooth ride, but the despair and uncertainty are gone. Yes, often there is the stress (especially during the sprint before the release) or anxiety but, I think that is unavoidable and it often actually pushes us forward. Overall Factorio now feels to me like a healthy project with clear direction rather than a very uncertain experiment it was a year ago. We all have worked hard to achieve this but a big thanks goes also to our fans, without you we wouldn't succeed in the Indiegogo, we wouldn't have the funds to continue the development later on when things started to drag and also we wouldn't have all the positive feedback that have kept us going. Thank you! 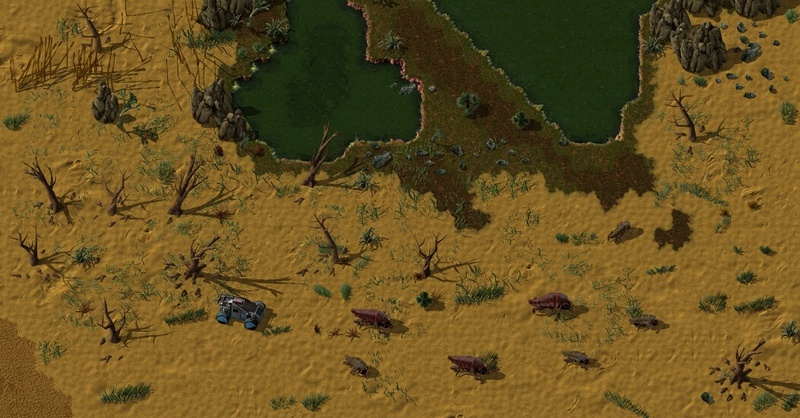 Now, for a more humorous look on what the development of Factorio is like check out this series of gifs by Kovarex on our forums. Albert has worked a lot on the doo-dads and some good results start to come out. Below is the preview of the desert with new trees, rocks and plants. The name of the image is "The desert hunt". Just to make sure, it is an artificial composition, not a screenshot from the game:). Next on the list are doo-dads for other terrains and then ship wrecks, destroyed machines, etc. As always check out the post on our forum for the comments.